Join us as we worship God together. Your spirit will be lifted as together we sing, pray, learn from scripture and sermon, and enjoy excellent music. Our minister’s sermons give us a positive message that we can relate to our daily lives. The gospel is good news! We greet friends, old and new. We hope that no matter where you are on life’s journey, you will feel welcome here. 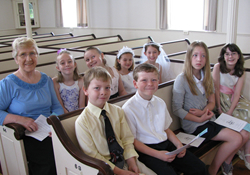 Our worship service and children’s Sunday School are at 10:00 am on Sunday mornings. Special services will be posted on our website. At the Church of Christ, we believe that music is a joyful way to worship God. We have lively and inspiring music at each worship service. Our organist/choir director Michael Sampson, begins worship with a joyful and welcoming prelude. At each service we are treated to a variety of music styles accompanied by organ, piano or other instruments. Our choir is open to all who wish to join; it’s a friendly, welcoming group, which seeks to provide inspiration and leadership for the worship experience. Children and youthful musicians also help us make beautiful and joyful contributions throughout the year! Our church also offers a bell choir which plays for special services, under the direction of Trudy Turcotte. First-timers are always welcome to join any of our musical groups. For more information, call the church office, 413-467-9742 or uccgranby@gogtt.net. Whether you wish to join a musical group, or just enjoy singing along to the hymns, you will find that music is an important part of the Church of Christ!